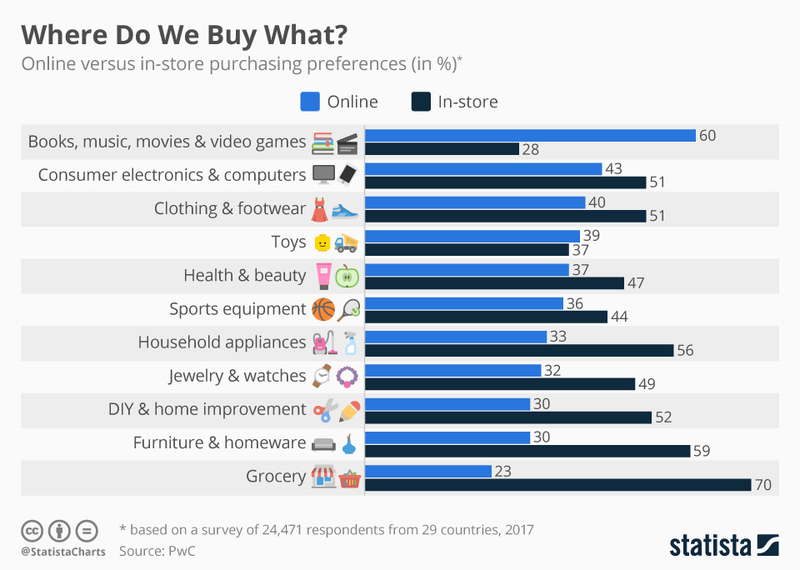 Accounting firm PwC recently did a study of 24,471 respondents in 29 countries asking if they prefer to buy various products online or at a brick-and-mortar store. As it turns out, online shopping is popular for some categories of items, but less so for others. The full results are listed in the infographic below. 60% prefer to buy books, music, movies, and video games online. I suppose this reflects the big shifts in this decade on how media’s consumed, especially music. This is also the only category where more people preferred to buy online versus at a physical store. Online purchasing of computers and other electronics has been popular for some time now, to the point it’s impacting businesses like Best Buy and the now-defunct RadioShack. Amazon, NewEgg, etc., often offer a broader range of choices or deals than physical stores. Buying clothes online can be a great way to save money. There’s been a big growth in both online-only clothing stores and physical stores now offering online ordering. That said, there’s something to be said for trying on clothes in person to see how they fit first. Despite the hype around home delivery and Amazon’s recent purchase of Whole Foods, groceries are the least popular category for online purchases; 70% of survey respondents still prefer to buy them in person. My guess is it’s still easier to just go buy groceries yourself, versus dealing with apps, delivery services and times, etc. That, and the fact your nearest Kroger, Safeway, Jewel-Osco/Albertsons, Target, etc., are often still cheaper. There’s a reason Whole Foods is nicknamed “Whole Paycheck”; whether that changes with Amazon as its new owner is currently unknown. dOn a related note, Kroger’s been on a buying spree in recent years; they’re either buying various smaller regional chains (such as Roundy’s/Pick ‘n Save in Wisconsin) or moving into new areas (such as opening Mariano’s in Chicago, after longtime local chain Dominick’s went under). 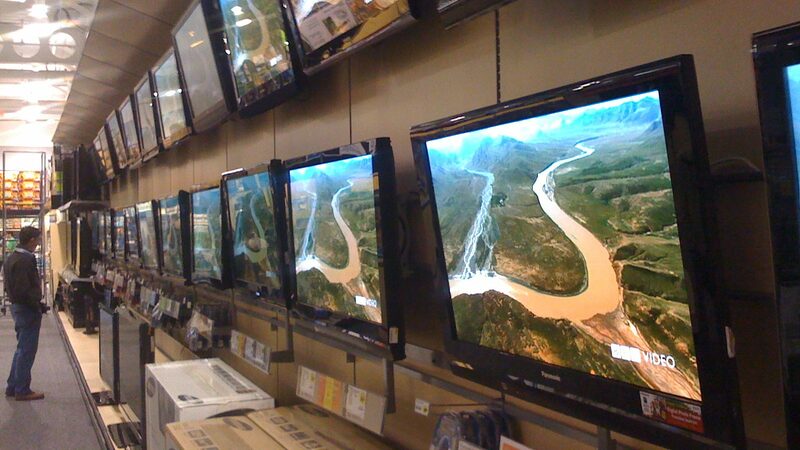 Many still prefer to buy big-ticket items like appliances or furniture in person, and probably for good reason. People want to see in person how their expensive new couch or bed looks and feels, which is harder to gauge online. There’s also the need for in-warranty appliance repairs. A lot of local or regional businesses are also still competitive in this area. Similar to the furniture category above, it’s often faster, easier, and better to go buy home improvement items in person. And again, there’s the need for repairs for, say, lawnmowers. Lowe’s, Home Depot, and various local/regional businesses still have a strong presence in this category. Where do you like to do your shopping for the above categories?